Q. Can I assign a library ebook as required reading for my students? Absolutely! However, please be aware that the UMD Libraries' ebooks have different user models, and some ebooks have restrictions that may prevent access if multiple students in your class try to read the book at once (or if they access the ebook too many times over the course of a semester). If you plan to assign all or part of an ebook as required reading for your students, we recommend placing the ebook on Course Reserves. 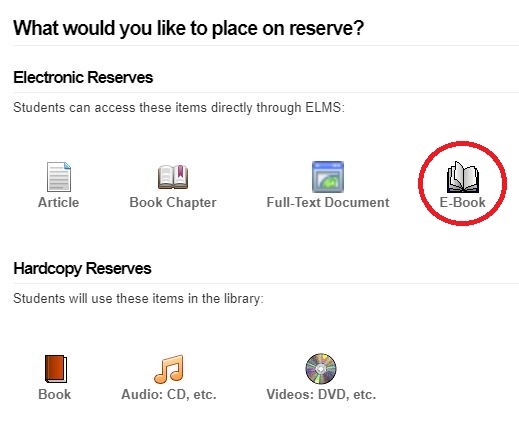 To do so, you'll need to first add the Course Reserves module to ELMS (following the instructions here), then under "Add Reserves Items," complete the "E-Reserve: E-Book" form. After you submit your request, Course Reserves staff will vet the ebook to determine if the Libraries' version permits unlimited simultaneous users (which is ideal for required class readings). If so, they will post a link to the ebook in the Course Reserves module in ELMS. If not, Course Reserves staff will proceed with ordering an unlimited user ebook, provided that one is available from our vendors. If an ebook meeting those specification is not available for purchase, Course Reserves staff will contact you to discuss alternate options for providing access to the content. If the Libraries doesn't own the ebook, we will also consider purchasing it for course reserves (budget and availability permitting). Follow the same steps above to request the ebook.